Posted: May 25th, 2015 under ApSIC Xbench. When we did our Dutch Auction Promotion last year, there was a very close runner-up price, €39/year. So we’re happy to announce that we are now running a promotion at this exceptional price. To buy one or more Xbench subscription years at €39/year until June 5, just place an order on our Web Store. You can buy more than one year if you wish. For example, if you buy 5 subscription years, you can choose to grant a license for 1 user during 5 years, for 5 users during 1 year or even for 10 users during 6 months. It’s your call, really. And remember that you can also change the number of users any time during your subscription to match your needs at all times. This promotion is available to both new and existing customers. If you already have an active subscription and you wish to extend it, please remember to place your order with the same email used in your previous purchase. ApSIC Xbench Connector for Memsource – Public Beta Released! Posted: May 11th, 2015 under ApSIC Xbench. We’re happy to announce that we’ve just released the Xbench Connector for Memsource. The beta is available to all Memsource Ultimate Admin and PM users. Memsource has been quietly morphing from a cool cloud-based translation tool into a full-fledged translation platform with a powerful API. We thought it was a good idea to capitalize on this transformation into a platform and we figured out some ways to bring ApSIC Xbench integration with Memsource to a new level. 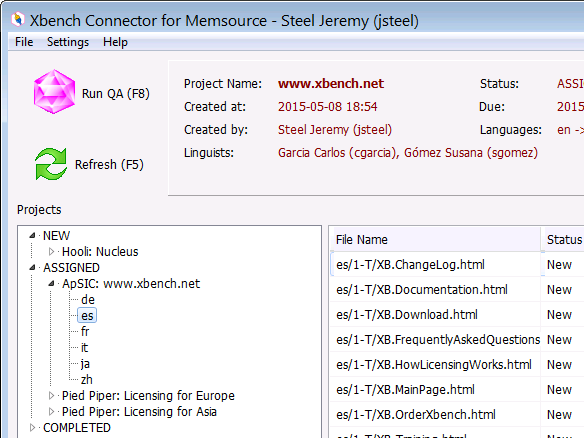 The Xbench Connector for Memsource is a Windows app that can be downloaded from our Downloads page. Choose a project and target language on the Memsource platform and instantly start a QA session in Xbench 3.0 for that project and language (this is very similar to how the Xbench Plugin for Trados Studio works). Also, if your Memsource project has more than one workflow step, you can also choose the workflow step for the QA session. When you find a translation issue in a Memsource file in Xbench, instanly fix it with Memsource Editor right at the segment with Edit Source. Quickly keep an eye on the progress of your Memsource projects in the cloud. A Memsource user with Memsource API access (currently, Admin or PM in Memsource Ultimate Edition). We hope you like the functionality brought by the Xbench Connector for Memsource. As usual, if you run into any issues running the connector, please let us know.